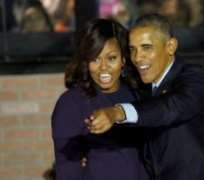 President Obama says both he and first lady Michelle Obama will be “very active” in working with people at the grass-roots level to support progressive causes once he leaves office. But despite her popularity and natural public speaking ability, Michelle isn't interested in a career in politics. According to Obama, one of the biggest challenges he and his fellow Democrats face is figuring out how to recapture the white working class voters who voted for him — and didn't vote for Hillary Clinton. Obama said the Midwestern voters who helped Trump win industrial states like Michigan and Wisconsin didn't get the message that the Democratic Party has been working for them. But Obama dismissed the idea that Trump's election represents a “hard-right” turn among U.S. voters. First lady gives a moving speech which is being called by some the speech of the decade.